My sisters and I love rainboots. Apart from being practical, they are so much fun! The bright colors and fun designs that they now come in would definitely add a splash of color to a dark, dreary and wet day! Wearing a pair would possibly even make you feel like singing in the rain -- while jumping on puddles and splashing water by the sidewalks! (Well ok, not really, that would be canal water heehee!). 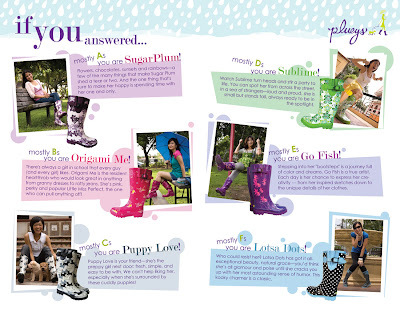 Last August 2007, the folks from Bright Cloud, Inc. (exclusive distributors of Plueys in the Philippines) made a timely move to introduce Plueys rainboots at the Rockwell Bazaar and a lot of you might have seen the variety of colors and designs they have to offer. If you missed that one, no worries! They're doing it for a second, but take note, the LAST time this year on November 16-18 so mark your calendars and don't miss out on this one!!! Now that you've found the right Plueys for you, try one on for size and see you at the Rockwell Bazaar ok?! hi! i've been reading your blog and found interesting and updated entries about fashion. Keep on posting! I'm just too jealous with the plueys because they have introduced it in the Philippines already.. I hope they'll be having those rainboots here in Singapore since rainy season here is all year round. haha!! Thanks anonymous! =) I do hope you get your hands on a pair of Plueys soon! Hahaha I remember going mad over those wellies the last time they were sold in Rockwell. Bought myself 2 pairs on the spot! I've been looking for a place to get wellies here in the Philippines because I hate having to get them shipped from the UK. Too expensive for a poor college student like me haha!